Keep Your Homes Safe From Radon! 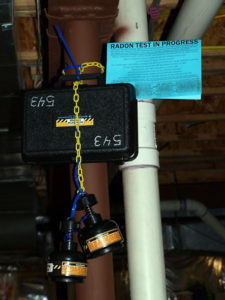 A Radon Test in progress in a home. January was National Radon Action Month. “But, Why is Radon Action Month important?”, you might ask. According to the North Carolina Radon Program, radon is a radioactive gas that occurs naturally in soil and rock and is invisible and colorless. The gas easily seeps through cracks in walls and the foundation of houses. As explained by the Environmental Protection Agency, radon exposure can lead to lung cancer and is believed to be the number one cause of lung cancer for non-smoking peoples. The first step to prevention or eradication of radon in your home is to test your home. Radon tests are available at home improvement stores, online to order, and sometimes through your state radon programs for a discounted price or free. The North Carolina Radon program explains, if your home hits at 2 pCi/L or less, your home is at a safe level for radon. If it hits above 2 pCi/L, test your home again. If it tests above 4 pCi/L, seek action to remove dangerous levels through mitigation. Be sure to check out the North Carolina Radon Program website, for tips and resources on radon, and stop by the N.C. Cooperative Extension, Union County Center to pick up a free radon test, while supplies last! Remember, National Radon Action Month may be in January, but checking for radon can be done, anytime throughout the year!